Hey. My name is Zak. Dad calls me Boy, or Zakkary when I'm not listening very well. 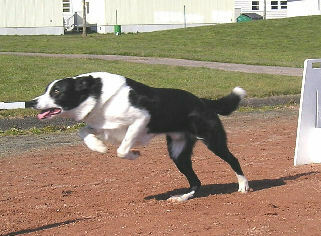 I'm a smooth-coat border collie, and I was born June 14th, 1999 in Cumberland, BC. I live with my humans Bret, Annette and Kaitlyn, and my pesky little canine sisters, Sammi and Keelah. 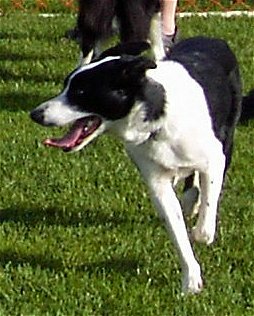 I started basic flyball training as soon as I came home, since my parents were already playing flyball with my big sister, Sasha, may she rest in peace. I was just over a year old when I ran in my first tournament, and I've been hooked ever since. I think Dad had a good time training me because I am very focused, and maybe even borderline obsessive. We did have to re-train my turn though - I hear the humans say that ideally, the dog should turn in the direction that is most natural to them; well, Dad discovered that I'd been turning the wrong way since I'd first started using the box. But since we got all that sorted out, I've really sped up! My average time is 4.4 seconds and my personal best is 3.83 seconds. Outside of flyball, I like to play Frisbee. Actually, even at flyball, I like to play Frisbee. Frisbee is my favourite thing! Did I mention I'm a little obsessive? I have a few little tricks - I can bow, and (ohmygawd - this is embarrassing - do I have to mention this Dad?) I can go to the bathroom on command. I am also a Canadian Canine Good Citizen.